Unique design keeps squirrels out! Roof on top keeps grackles and starling from feeding! Large Woodpeckerssuch as Flickers, Sapsuckers, Red Headed, Red Bellied, and Pileated Woodpeckers can hang from the bottom and feed. Starlings and grackles cannot access the suet from the top, sides or bottom of the suet feeder. Holes on the sides are 1-1/2 inches X 1-1/2 inches and the bottom is 1/2 inches X 1/2 inches. 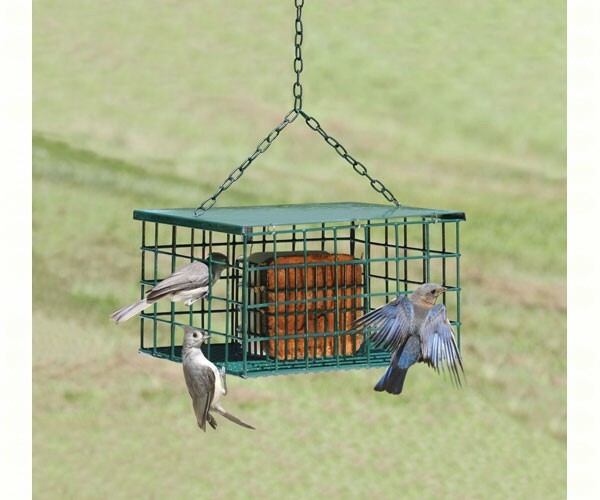 Inner suet cage is 4-1/2 x 3 x 4 inches. Overall size of feeder is 12 x 6 x 9 1/4"
A very unique suet feeder that eliminates pesty birds and squirrels. Save on food by only feeding the birds you want and eliminating squirrels and pesty birds.